If the enemy hit is casting an ability they are interrupted, set Off Balance, and stunned. The damage over time deals additional damage to low health enemies. 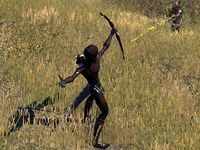 Poison Arrow: Shoot an arrow coated in Baandari poison at an enemy, dealing [3691 / 3731 / 3772 / 3813] Poison Damage and an additional [6909 / 6978 / 7049 / 7137] Poison Damage over 10 seconds. Venom Arrow: Shoot an arrow coated in Shadowscale poison at an enemy, dealing [3819 / 3860 / 3901 / 3945] Poison Damage and an additional 7135 Poison Damage over 10 seconds. If the enemy hit is casting an ability they are interrupted, set Off Balance, and stunned for 3 seconds. Poison Injection: Shoot an arrow coated in Baandari poison at an enemy, dealing 3816 Poison Damage and an additional 7135 Poison Damage over 10 seconds. The damage over time deals up to [200 / 220 / 240 / 260]% more damage to enemies under 50% Health. Poison Arrow deals poison damage to a target, and additional damage over time. It can be a very effective attack on single targets, especially when combined with other abilities. The Poison Injection morph makes it particularly effective as an execution spell, as it is more effective when your target is at low health. Alternatively, the Venom Arrow morph interrupts and stuns spellcasting a spellcasting enemy. The poison damage does not stack, so there is no benefit to hitting the same target again while the previous poison is still in effect. Use other attacks instead while waiting for the first poison to expire. This does not apply if another Poison Arrow was cast by a different player. Depending on latency, it may appear that the damage over time is not occurring, but if you wait long enough, the target will appear to receive all of the poison damage at once (which is usually enough to kill most normal enemies). This can be problematic when playing with other players, as they may not realize that the target they are attacking is about to die anyhow from the poison. Even without the poison damage, this can be an effective attack as a follow up to a regular heavy attack. Pulling back to a full draw on a bow takes a few seconds, but the Poison Arrow fires instantly (at the cost of some Stamina). Thus it's best to fire the regular shot first (before the target sees you and starts attacking) and immediately follow it with a Poison Arrow. Often, this two-shot strategy is enough to kill most regular enemies around your own level. Poison Injection is a recommended morph for the Venomous Dragon, Umbral Assassin, Arcane Warrior, Luminous Warrior, and Savage Stalker builds. The Caustic Arrow set from Dragonstar Arena increases your Weapon Damage against enemies affected by this ability. The Piercing Spray set from Asylum Sanctorium can cause this ability to do more damage when combined with Arrow Spray. Increased the damage-over-time for this ability by 50%. Increased the damage over time for this ability by approximately 30%. We also fixed an issue where this ability couldn't critical strike. Poison Injection: This ability now starts dealing bonus damage on targets under 50% health instead of 35% health. Fixed an issue where you were able to block the damage over time from various player abilities, such as Poison Arrow or Unstable Flame. Increased the damage over time from this ability and its morphs by 12%. Fixed an issue where this ability and its morphs were not applying their damage over time to targets that blocked or absorbed the damage. Poison Injection: Fixed an issue where this morph's bonus damage to low-health targets was applying to equipped Poisons and the Poisoned status effect. Poison Injection: This morph will now recalculate its damage over time each time it ticks. This fixes the issue where the execute damage was not updating as the target gained or lost health, but also means the tick value can increase or decrease if your stats change while it's active. Known Issue: Poison Injection will currently consume the Cruel Flurry enchantment bonus but will not gain the benefit from it.